Firestar toys has just launched this cool new T-Shirt and matching mug and once again we are running a competition to win them. Firestar is also offering a new minifig engraving service enabling you to customise selected designs with a name or message. Find out more about this and how you can win the shirt and mug after the break. 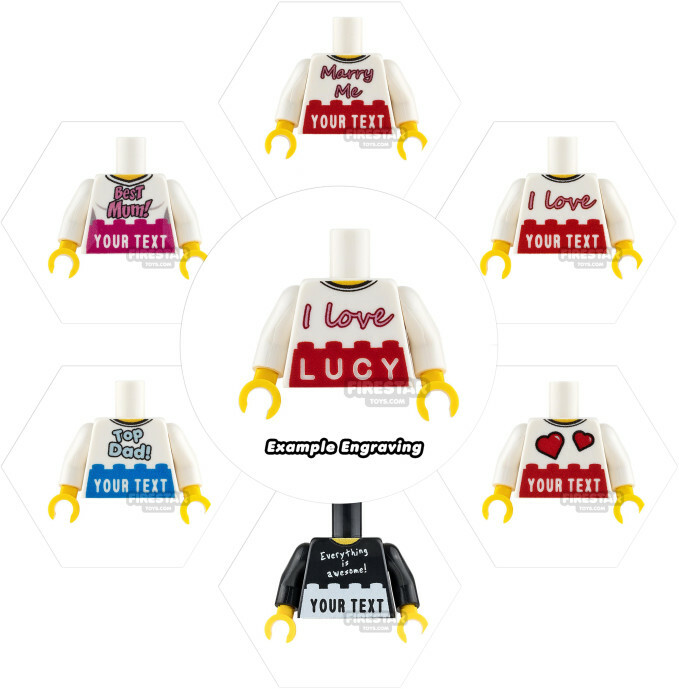 The ultimate personalised gift for the LEGO fan in your life! We do things a little differently to ensure a super sharp and crisp text that stays looking awesome! Normally, engraving is produced on a blank LEGO part with acrylic paints rubbed in, so the text shows up. However, the paint will start to fade and chip, so the text will begin to look worn and eventually disappear. Our idea is to digitally print a design first and then engrave over the top, so the LEGO colour shows through. This creates a super sharp finish which will never fade and always look amazing! We'd love to hear your ideas for what torso designs -- suitable to have a name engraved under them -- we should produce next. So, to enter the competition simply comment on this article or the Facebook post and tell us your suggestion by Monday midnight. The best two will win the prizes and have their designs turned into products. The next one would be a little too difficult I guess, but would love it if you teamed up with lastexittonowhere.com and be able to reproduce some of their great film inspired tshirts, to really personalise our little guys and gals! :)Even just basic film names and logos, ala Top Gun, Aliens, Robocop etc, in in the right font. Improvement - the love heart torso should use the brick design seen in some Friends sets. I think there should be a "Get well soon!" torso. I know any time I've been feeling under the weather, I would have LOVED to get a custom figure with that on it! May be with studs down because if they flip you can read «LEGO». Other variant may be each number on 1x1 bricks not on 1x4. Also: "Hello, my name is ____"
Also also: "____'s lover/father/daughter/bff".... they're endless. Any number of emoji will be suitable for this - obviously the faces: smiley, sad, sick, sticking out tongue, and of course the poo. And then there are the non-face ones like the hands, hearts of different colours (you already have a 2 hearts one) animals, food and everyday items. As for something 'original' I would like the Star Wars Rebel and Imperial logos, and the Star Trek logo. and even better if you can do it in a range of plain coloured torsos, to allow people to pick their team colours. You could probably do an oval ball as well for rugby / American football fans. "My name is _______, you killed my father. Prepare to die." "Insert name here" With an arrow pointing down.
" I belong to _______ "
I also really like Colay's idea of a single letter of the alphabet on each so you can spell things out with minifigs. I like the idea of "I'm a stud" with the name engraved like the lego logo on the printed stud of a piece on the shirt. 'These aren't my pants' with an arrow pointing down. Will you brick with me? I think holiday greetings would be cool. Things like, "Merry Christmas", "Happy New Year", "Happy Birthday", and so on. They'd make some neat gifts. I think these would all make good designs. Thank you! I'll always stick with you "____"
I like the "Master Builder _______" ideas mentioned above. Male of female torso with an oversized medal you could add text to. Graduation figure with Year and school on the back of the torso. @Game on! I like your "builder since ______" idea, I would totally get that shirt. There is too many to put down. "will you be my 1x5?" The houses of Harry Potter would be awesome! "Under this print, I'm naked." How about one that says "I'd Rather Be _____" on the front with a logo on the back that relates to what you put in the blank. For example, "I'd Rather Be Fishing" would feature a fish on the back; "I'd Rather Be Building" would show a LEGO brick or two; etc. Another idea I had is that they could put an oval outline with letters inside like those bumper magnets/stickers people get on trips ("OC NJ" for Ocean City, New Jersey, for example). How about some sports jersey's from popular teams?! That would be pretty neat to see. Or maybe there could be one that says "I'm a Stud" on it! How about 'THANK YOU *NAME*' so that way you can give to friend, family member or for your child to give to their favourite teacher? "________ is a real Blockhead!" I like the one with the twin hearts followed by the name. Could do similar ones with Shamrocks, Easter Eggs, Christmas Trees. Please log in to post comments on this article. Brickset is a community of LEGO fans from around the world with a passion for sharing, discussing, recording and building. Sign up for a FREE account to unlock all the site's features and to enjoy it ad-free.